Institute for Christian Renewal – An interdenominational ministry of teaching and healing. It has been your donations over the years that have helped this ministry bless God and help people. Donations to THE OPERATING FUND maintain the office, pay Canon Mark a salary, help churches that might not afford a conference led by a distant speaker to have one, and make possible the printing and mailing of this Newsletter. THE BUILDING FUND has enabled us to buy 7+ acres of land, erect the first building (medical, counseling and massage rooms, business offices), and erect The Meeting House (for worship and conferences). We still have some work to do to finish The Meeting House and we are already making plans for The Residence (where people can come and stay on retreat, or for ministry.) Would you help us, please? Would you consider a donation at this time? It can go entirely to The Operating Fund, entirely to The Building Fund, or to both — please specify how much you want to go to each. 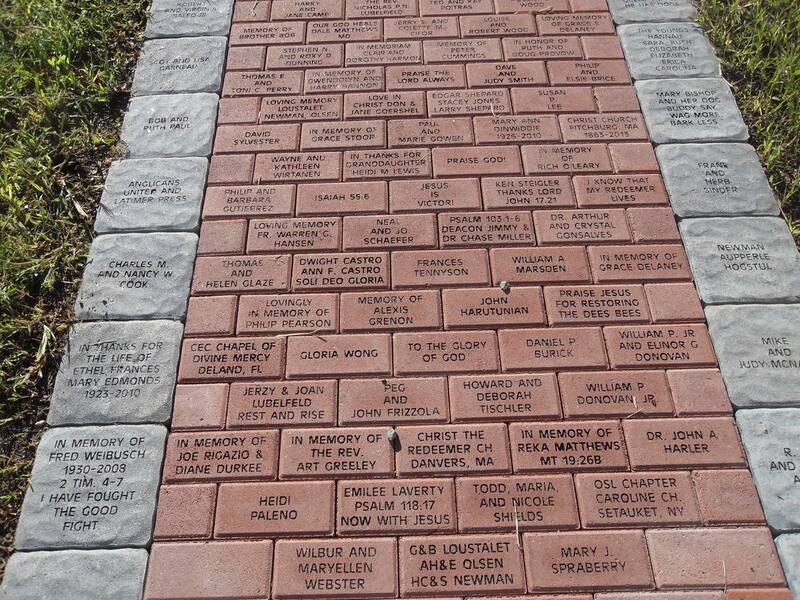 For a donation of $200-599 we will place a brick on a walkway; for $600 and above a paving stone. Let us know what you would like carved — a thanksgiving, honoring a loved one, your name, a Bible verse, or some- thing funny. BRICKS can hold three (3) lines of up to thirteen (13) characters; PAVING STONES seven (7) lines of up to thirteen characters. Thank you. There’s a spiritual equivalent of “money in the bank.” It is those experiences of God at work in and for you, the recollection of which can help you when you’re going through a tough time. You’re very sick, or out of work, or having family troubles. As a result, you’re not making a connection with God in your prayer time or on Sunday worship. Either you’re down on yourself, thinking that you’re a third-rate Christian, or else you’re lashing our at others and at God. You start to wonder if “this Christianity stuff” is for real. Thank God, however, you’ve got some spiritual “money in the bank” on which to draw. In the early 1980s, when Institute for Christian Renewal was just beginning, I had few speaking / ministry engagements and just a few donors supporting the work. I was literally down to one can of peas in my pantry and I had no money in my pocket. I knew the Scriptural promises of God’s provision but I had never had an experience of Him providing at the very last minute. A friend of mine was praying for his sister who had a life-threatening illness. He was starting to doubt God’s willingness to heal today. As a result he was not praying with either faith or regularity. Then he recalled how he had witnessed two people healed at his church, both with major illnesses. While he didn’t know whether God would heal his sister, he did come to believe again that God could do this. His prayers became more confident and more regular. His witnessing of those healings had become the “money in the bank” he drew on profitably when his faith was weak. You may note I’m identifying “money in the bank” with spiritual experiences, not just with God’s promises found in the Bible. Of course, God’s written word of Scripture stands paramount and stands in judgment of any spiritual experience we may have. Because some of what we deem spiritual experiences are caused by factors other than God at work we cannot trust our experiences without verifying them with what the Bible teaches and promises. Having said that, however, we often believe in but not profit from God’s promises found in Scripture because we believe that, while they’re true, they’re for other people, not for us. But when we experience something ourselves, then those experiences become that precious “money in the bank” to help us through rough spots. We could then say that spiritual “money in the bank” is God’s promises experienced by us and stored up for later use. 1. The Transfiguration. Take a minute to read the story of Jesus’ Transfiguration in Mark’s Gospel, chapter 9, verses 2 to 13. As the fledgling Church witnessed to the Risen Christ there were skeptics who asserted the message being preached was just made up. The Old Testament was not fulfilled in the New, so they said. God the Father did not honor Jesus as His only Son nor did the Father specially honor Jesus. “Why do you believe all that nonsense, Peter,” somewhat might heckle. “James, what personal experience of a supernatural Jesus do you have?” another might assert. What might they say to such skeptical challenges? Here’s what Peter said, “Because I witnessed it myself on the holy mountain. I saw what happened and I heard God’s voice” (see 2 Peter 1:16-19 where Peter refutes scoffers with his personal witness of Jesus’ Transfiguration). When our teaching or our witness is challenged we refer people not only to God’s written word in Scriptures but also to what we ourselves experienced as God worked supernaturally in our midst. Two of the reasons the once mighty “Main Line” denominations are rapidly shrinking is that many of their clergy openly mock the accounts of Scripture and of the many people whose experiences line up with it, and try hard to talk their parishioners out of believing that the experiences they have had of God were real. 2. The Raising of Lazarus. “Many” (says John 11:45) witnessed Jesus raise Lazarus from the dead (take a minute to read John 11:1-44 for the whole story). At the cross many mocked Jesus saying, “He saved others, he cannot save himself” (see Matthew 27:42). Jesus’ disciples could not help being bewildered at the horrible events unfolding on Good Friday and they could not help wondering if those mocking faith in Christ might be right. Of the eleven remaining apostles all ran away except for John. But note: they did not run far. They were still in Jerusalem. Moreover, they did not need much persuasion to check out the empty tomb when they were told on Easter morning that Jesus had risen. I do not find it strange that on Good Friday ten apostles were not at the Cross. I find it incredible they stayed nearby. Their experience of seeing Lazarus raised was “money in the bank” for their faith during the darkest time of Good Friday. Twice over the past ten years I have recovered lost property for people. The Treasurer of the Commonwealth of Massachusetts places newspaper ads and has a website about abandoned property. It seems there are numerous people who have forgotten about bank accounts, stocks, and insurance policies that are rightfully theirs. We might wonder how people could forget things like that, but there are many who have forgotten and still do forget. But might we have forgotten our spiritual “money in the bank”? So as a result, when things are going badly, though we possess riches, we live in poverty. How can we recover that which is truly ours? First, ask God to remind you. Get quiet with the Lord. Ask Him to remind you of times when He worked supernaturally in and around you. As you recollect events, write them down. Second, ask others. Ask friends, family, clergy and church friends who have known you over the years to remind you what God has done in your life. Write these events down, too. Third, make a list. Give each one of these events a short title — like the title of a magazine article — so when you see the title, you’ll remember the story. Make a list of the titles. Put photocopies of this list in easily accessible places such as your car’s glove compartment, your dresser, your wallet or purse, and, of course, in your Bible. Fourth, review the list. When you’re in a tough spot and your faith is wavering, stand on the promises He makes to everyone in Scripture, read the stories of how God worked “in Bible days” and has worked throughout history, and read over your how it works for you!“money in the bank” list of what He has done in your life. Finally, add to the list. When God does something powerfully in or around you, add the story of it to the list.